On foot, you gain a very different perspective of the safari experience. Your senses are heightened as you begin to look for the slightest flicker of movement through the bushes, or the faintest sound coming from ahead. Setting out on a walking safari in the Masai Mara ecosystem not only offers you the chance to stretch your legs, but also the opportunity to focus on some of the smaller ecosystems that are often overlooked from the height of a vehicle. The intricate construction of termite mounds, the role and importance of dung beetles, and the variety of birdlife in the area are just some of the subjects you may encounter on your excursion. The walking safari guides are all highly trained and carry a wealth of information that they are only too happy to share, be it about a peculiar track in the sand or the call of an unseen bird. Walking safaris are not permitted in the Masai Mara National Reserve. A briefing is conducted before the walking safari on how to react when confronted with big game in close proximity; however, the skill of the walking guides means that these uncomfortable situations rarely arise. 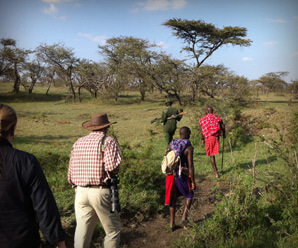 The sense of adventure that comes with a walking safari is difficult to replicate. It is this freedom to deeply immerse yourself in the wildlife experience, that makes the Mara Naboisho Conservancy so special and unique.